Being stricken with the incurable condition of aquaholism from an early age, the only reputable medical advice was to get regular doses of salt spray. Recreational sailing and other associated water activities assisted keeping the symptoms at bay, and despite the miles now mounting on my clock, the desire to go sailing has not diminished. It certainly beats sitting in a lazy boy at home watching golf on TV, playing bowls and trolling farce book and other anti social media. A career change 5 years ago allowed me to go sailing almost full time and mastering the art of getting a leave pass from my understanding, but long suffering wife, certainly helped. Since 2013 sailing has occupied a lot of my time, clocking up about 20000 ocean miles, so I thought I could call sailing my occupation, but I don’t get a lot of support with this belief. And as for scary moments in sailing, capsizing with my wife to be on Hamilton lake in the middle of winter while I wore a wetsuit and she didn’t, is still haunting me to this day. 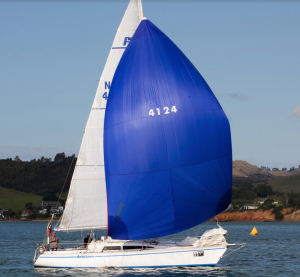 Sailing in the RNI race in 2017 was a lot of fun, and although extremely challenging, it certainly acted as motivation to attempt the RNZ race. Murray and I met during that RNI race. We are very much the oldies of the fleet but really looking forward to the adventures, challenges and the sense of achievement that completing a race like this will bring. Having the favourite of my three kids, Ken (who may have admin rights on this site), also in the race adds an extra dimension, not that I am competitive. What with Sir Frances Chichester being my age when he sailed single handed around the world, I am confident I can two hand it around NZ! Time will tell! My name is Murray Hartley and my yacht is a Farr 38. 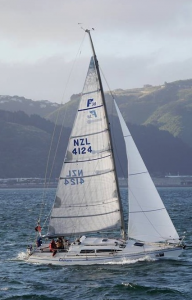 I bought her in Auckland 10 years ago and sailed her back to Wellington, where I tried round the buoys racing for a couple of seasons. 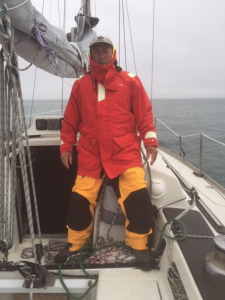 I decided that that style of racing wasn’t for me and I wanted to do short handed offshore racing, so after a lot of work Arbitare was ready for adventure. The RNI came along so I thought I would enter the race. The only modification Arbitare has is a stainless steel prod which I built with the help of a local engineer. Because I live rural, his experience was in fixing tractors! It was built to withstand all conditions but probably hasn’t helped the boats weight! I sail out of the Titahi Bay Boating Club. After the exhaustion had faded from the RNI I started to look around for my next adventure, and when the email came through about the RNZ I entered that day just in case I changed my mind. I have been sailing from an early age as my father Phil Hartley was a keen Wellington yachtie most of his life. After centreboarders I sailed keelers with him on an assortment of yachts, one of which was a Farr 38. Funny how I ended up with one as well. I met my co-skipper Dave Ormandy in the Napier Yacht Club after the third leg of the RNI. We were having dinner in the club having decided not to partake in Mexican and lots of red wine with some of the others. I remember sitting with Dave and Ritchie from Cool Change and a few others thinking “man these guys have a lot of experience.” Just listening to the conversation of near misses and little gems of wisdom in casual throw away statements, on topics ranging from marine dysentery and its cure to weather and tides etc. was pretty cool. Not long after I entered the RNZ I got a call from Dave saying he was keen so that was that sorted. 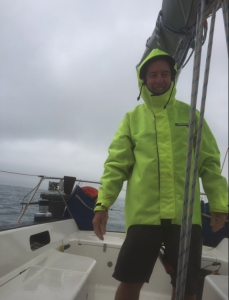 I think the most out there moment was in the last RNI when Max and I were caught in a weather bomb in the Bay of Plenty on the last leg, we were in the middle of BOP when it hit, nothing we could do but get on with it. My offshore vice is salt and vinegar ripples – can eat them all day, 4 in the morning, whenever! I am sure Max looked at me sometimes thinking really? With the RNZ I think getting around in one piece is the task at hand. Once over the finish line it will be ring my wife, hot shower, rum, food and sleep in that order.